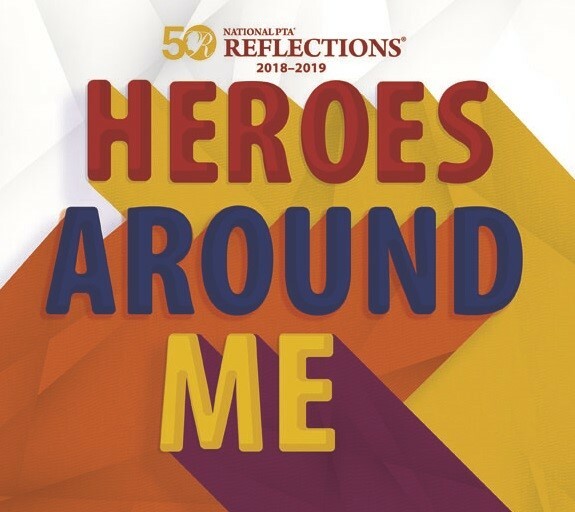 Stretch your artistic muscles and participate in the National PTA's REFLECTIONS program!! This year's theme is "Heroes Around me". Entries are due by Friday, November 16th. ​Not familiar with Reflections? See our flyer 'Reflections at a Glace' to learn more! ​Film/Video -- original works, with or without sound, of animation, narrative, documentary, experimental or music video/film. ​Music Composition -- original musical composition, with or without words. Photography -- color or black and white, including techniques: photogram, retouched, montage, sandwich and multiple exposures. Visual Arts -- drawing, painting in tempera, oil, acrylic, watercolor & t-shirt paints, computer generated art, two-dimensional collage, printmaking, needlework & leather tooling. NO 3D art will be accepted by WA state. See our Reflections at a Glance flyer to learn more about Reflections. Have a good idea for a Reflections Theme? Enter the Theme Search contest and win $100 if your theme gets chosen! Entries are due by November 1, 2018. Chinook Middle school, Grades 6-8 are eligible. A student may submit entries in more than one arts category. Each student entry must be accompanied by a paper student entry form, signed by a parent or guardian. Student entries must include a title and an artist statement, which communicates the artist’s inspiration for the work and how it relates to the theme. The statement must describe the content and include at least one sentence but not exceed 100 words.